It was a match for the ages that took place at RIMAC Arena on Monday night at 7 p.m. 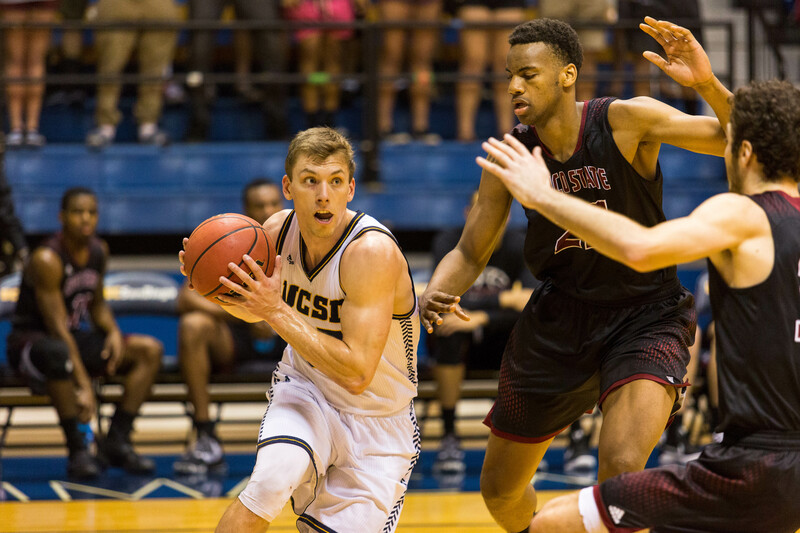 The UC San Diego Tritons took on California Collegiate Athletic Association foe Chico State with a trip to the National Collegiate Athletic Association Elite Eight on the line. After a back-and-forth affair, UCSD got cold in the end stretch and lost the foul game, and Chico State ultimately prevailed 94–86. It was the last game for senior guards Adam Klie, Aleks Lipovic and Koree Cox. UCSD was stopped in the Sweet 16 for the second year in a row. The UCSD Tritons, after sweeping the CCAA regular season and conference championships, hosted the Division-II NCAA West Regionals for the first time in history. The No. 19 Tritons, the top seed in the region, took care of eight-seed Dixie State and four-seed California Baptist University en route to a Sweet 16 berth. On Friday night, UCSD was clearly the superior team, dominating Dixie State to the tune of 17 threes and a comfortable 94–68 victory. On Saturday night, in their second round matchup with California Baptist, the Tritons had more trouble but escaped victorious in a back-and-forth affair against the Lancers’ top player and D2CCA West Region player of the year senior guard Michael Smith. The Tritons were led in this game by senior guard Adam Klie, a D2CCA West Region first team player, who battled through foul trouble to lead UCSD to victory. Chico State, a familiar CCAA opponent for the Tritons, did not come into the tournament with as much hype. The sixth seed, who was not nationally ranked, took down third seed Western Washington and No. 4 Hawai’i Pacific, the second seed. The Tritons and Wildcats played three times already this season, with UCSD winning two out of three meetings, most recently in the CCAA Tournament quarterfinals, 65–53. When the top-two CCAA squads of the past few years face off in such a pressure filled game, you would expect the atmosphere to be electric. Under the applause of a few hundred UCSD fans and a rowdy Chico State visitor bleacher, Chico State won the toss and proceeded to score the first points on two free throws by junior forward Isaiah Ellis. After two more points by Ellis, it was clear that Chico State’s plan was to double sophomore center Chris Hansen in the post to disrupt the Tritons’ offense. It didn’t bother senior guard Aleks Lipovic, however, as he scored the Tritons’ first points on a fade-away jumper. The Wildcats’ length seemed to cause the Tritons’ problems, but it didn’t stop Klie from attacking the paint and getting his first point of the game on a free throw. With blazing speed, junior guard George Buaku followed suit with a transition layup, bringing the Tritons back within one point. Ellis and sophomore forward Marvin Timothy combined to score the Wildcats’ first 11 points and put the Tritons in an early six-point deficit. At the first timeout of the half, UCSD was only down by four. Freshman forward Scott Everman came in and quickly contributed with back-to back three pointers, the Tritons’ first three-pointers of the game. With the score tied at 15, Chico State continued to try to use its size to back the Tritons in in the paint, but the Tritons were having none of that. On the counterattack, Klie got to the rim for an emphatic slam that had the crowd on its feet. After a Chico State three, the score stood at 18–17 in favor of the Wildcats with 11:50 remaining in the first half. Junior forward Christian Oshita and Lipovic both came back in and made their presence felt, with Oshita burying a three. With the Wildcats crashing the offensive board effectively, they continued to put pressure on the Tritons, even trying out a full court defense. The Tritons kept their composure and even took the lead on an Oshita three. Chico State took back the lead on a three-pointer by Ellis, who was already on double-figures with eight minutes to go in the first half. Everman with the driving layup after a pump-fake made it 27–29 Wildcats, but Oshita’s first foul put Ellis back on the free-throw line. Klie with the three brought the Tritons within one, and on the other end they forced a jump-ball to get the ball back. At the media-timeout, with only 3:45 left to play in the first half, UCSD was only down by one, 30–31. Ellis continued his monster half posting up Oshita to bring his point total to 17, and it looked as if the Tritons didn’t have an answer for him. On the next possession, however, Oshita forced the charge on Ellis, and Lipovic scored his first three pointer of the game. Ellis continued to abuse the shorter Oshita, and, with another jumper, increased his total to 19. On the last possession of the half, Chico State held the ball but drew a foul. They missed the free throw, and with eight seconds left, Klie drove down the floor but could not get a shot up before the half. On the first possession, Hansen, who was in foul trouble for most of the first half, scored his first points on a putback after grabbing the offensive rebound. Out of the timeout with seven minutes left, Chico State was up by one, 65–64. Ellis got fouled and went to the line scoring one free-throw, and, on the other end, Lipovic rose for the three and connected to put the Tritons in the lead again. Oshita continued to fight on the boards and yanked a rebound out of the air and was fouled. He got his free throws to go and equalized for UCSD. Junior guard Corey Silverstrom continued his solid second half, sinking two free throws, bringing his total to 12. The Wildcats continued to put pressure and drew a slew of fouls and, with only 3:55 remaining, took a five-point lead, 76–71. Out of the timeout, Hansen drew the foul and got his two free throws to go. UCSD forced the turnover on a shot-clock violation but coughed the ball up on the offensive end. Klie continued his aggressive game and connected on the layup with the foul. He missed the free throw, however, and, with 2:25 left, Chico State was up by three. Oshita grabbed the rebound and was fouled, and he connected on both of his free-throw attempts. With UCSD only down by one point, the team could not contain Silverstrom, who connected on another deep shot to bring the score to 81–77. After Buaku missed a shot on the offensive end, Lipovic fouled Silverstrom, who connected on his free throws to bring the lead to six. Down 83–77 with 90 seconds to go, UCSD played the foul game but could not connect on any shots down the stretch. After Oshita finally scored a three-pointer, UCSD was down by nine with 48 seconds to go. The Tritons could not mount a comeback in the final seconds of the game, and the Chico State Wildcats advanced to the Elite 8 with the 94–86 win. Four Tritons finished in double figures. Klie scored 28 in his final game as a Triton, Oshita contributed 23, Lipovic 14 and Everman 11. The Tritons fell under the repeated assaults of tournament MVP Ellis, who had 34 points, and Silverstrom, who dominated the second half and finished with 20. For the Wildcats, Briggs also had double figures on five of six shooting. Chico State now advances to the Elite Eight with the win, while UCSD’s season ends at a program record 27–6.